If you want to climb Clash Royale's Arena ladder, then you'll need to learn how to deploy your troops, buildings, and spells properly on the battlefield. That means regularly leveling up some of the best cards available for the game as you continue collecting cards and opening chests. More importantly than that, you also need to bring the right deck into combat. Entering a new Arena means new opportunities for new cards, and failing to change up your hand means you'll end up overpowered by stronger opponents. 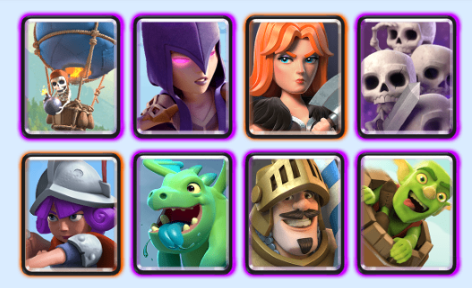 Whether you're just starting your Clash Royale career or are working your way up to the last few Arenas, here are the decks we recommend taking into battle for each Clash Royale Arena. Goblin Stadium is Clash Royale's starting Arena and its easiest. 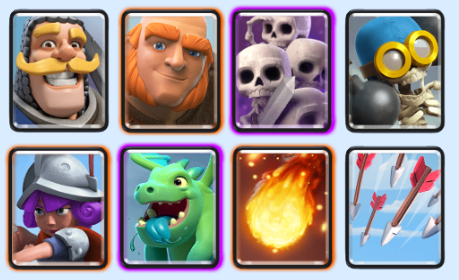 You'll find some of the most basic troops and spells here, including Giants, Minions, Goblins, Hog Riders, and occasionally even a Hunter or two. Arena 1 is a great place to learn Clash Royale's basic strategies, and here is the best starting deck for this arena. Let the Knight and Giant spearhead offensive pushes against towers. These units are tanky and can withstand significant damage your Minions and Skeletons get to work, chipping away at your enemy's other buildings. Once you graduate to Arena 2 you'll find things start to slightly change in Clash Royale. While Arena 1's basic tactics still come in handy, most players have collected Arena 1's unlockable cards and are on their way to securing those found in Arena 2. As you advance through the Bone Pit, expect to see more Balloons and Giant Skeletons. Here's our preferred deck for this Arena. The Baby Dragon is a powerful ranged air unit that can wipe out weak swarms and force your opponents to deploy troops like a Musketeer or Archer. Combined with a Giant and a Musketeer, these units can pack some serious punch while pushing against a defenseless Princess Tower, making them a vital part of any player's offense. Next up is the Barbarian Bowl. By now, you should have cut your teeth on Clash Royale's basic strategies and developed a style of your own. The Barbarian Bowl introduces this Arena's namesake, the Barbarians, and also features several new buildings for players to collect. Here's the best deck to get through this Arena unscathed. Mini P.E.K.K.A serves as both a distraction against weaker enemies and a powerful offensive unit that can do some serious chip damage against an enemy's Princess Tower. Use the Goblin Barrel to put pressure on your enemy's weaker structures or distract your opponent during their offensive push. This will effectively split their army. Welcome to P.E.K.K.A's Playhouse. 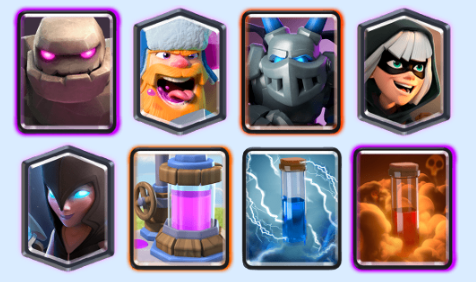 This Arena introduces the game's first two Legendary cards, the Miner and P.E.K.K.A. By now, your go-to cards should have fairly high levels, and you should have the option of subbing out troops like the Minion for the Minion Horde instead. Since things can get a little complex here, this is the deck we recommend using for Arena 4. The Witch serves as a versatile offensive and defensive unit, letting players weigh down building-focused troops like Hog Rider while providing some ranged damage of her own while attacking towers. Use her in combination with the Baby Dragon and Prince for a powerful push against Princess Towers or the King's Tower, giving your opponent a headache to counter. Spell Valley introduces some of the higher level cards that continually get rotation in both competitive play and the higher Arenas. This includes Bats, Wizard, the Night Witch, and the Graveyard spell. If you don't unlock these cards right away, then don't worry: You can perform quite well on Arena 5 without them. Here's our deck recommendation for this Arena. 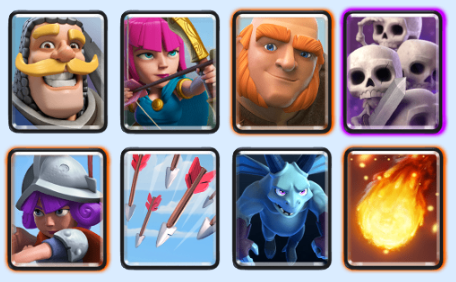 You may recognize Zap from other Clash Royale guides that recommend the spell as an alternative to Arrows. Be warned that, while cheaper than Arrows, Zap can be difficult to master. Because Zap deals area damage and stuns higher level enemies, you'll want to primarily use it against incoming swarms of low level Goblins, Minions, or a Skeleton Army. You can also combine Zap with a counter push from a Valkyrie to deal with any straggling hordes. Once you reach Arena 6, you're halfway through Clash Royale's ladder. The Builder's Workshop introduces several buildings and spells that regularly get rotation throughout the higher Arenas, such as the Inferno Dragon. The most important card you can acquire here is The Log, which is often considered one of the best spells that any player can have in their Clash Royale deck. But if you miss it, don't worry: You don't necessarily need to use it right away in this Arena. Here's our deck recommendation for the Builder's Workshop. While it may sound redundant, consider using your Inferno Dragon and Baby Dragon together to create a double-dragon combo. Deploying both units at the same time lets you deal enormous damage to troops with low and high health, especially while defending a Princess Tower. 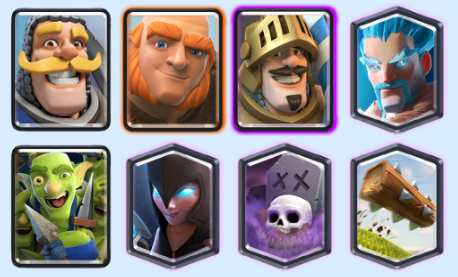 Both troops also do wonders in a counter-push, especially one led by a Giant Skeleton or Prince. The Royal Arena is where your deck meta really starts to change as you prepare for the higher Arenas. You'll most likely be swapping out some cards that have been in rotation for some time. You can unlock the Princess, Dark Prince, and Guards here among others, which you may want to consider subbing in if you level them up early on. 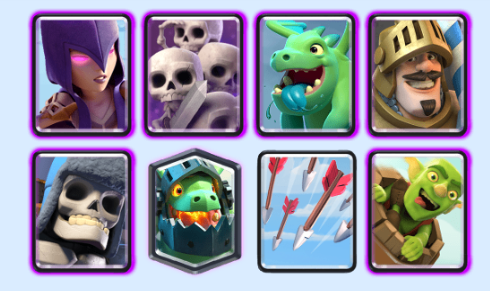 Consider using the following deck before going into battle. While more expensive than the Giant, the Golem is a tanky heavy-hitter that also spawns two Golemites when it dies. That gives players the opportunity to continue a push against their enemy's towers after the Golem dies. 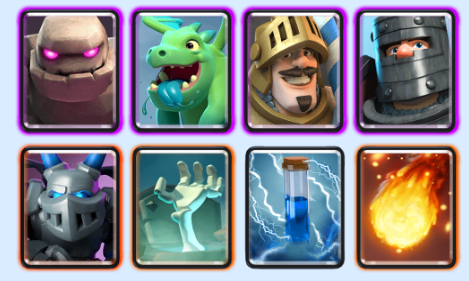 Combine the Golem with a Mega Minion to deal some serious damage on the offensive, and use Zap to wipe out a Skeleton Army or other weak troops attacking your push. Arena 8 introduces some popular additions into your deck, including the Elixir Collector, the Tornado, and the powerful Ice Wizard, which you'll see used in play plenty of times as you finish the Arena ladder. Frozen Peak changes up your deck significantly, and expect to see newly-acquired cards subbed in as you continue opening chests. Here's our favorite deck. The Elixir Collector lets you spawn additional Elixir to put some of your more expensive troops into play, such as the Golem. This building also works great for building offensive pushes since it gives you the opportunity to quickly add cheap units into a push or counter-push, such as the Mega Minion or Skeleton Army. Arena 9 adds the Bandit and Goblin Gang into chests, and this is the Arena where you'll start putting more Legendary cards into rotation, like the Ice Wizard and Night Witch. 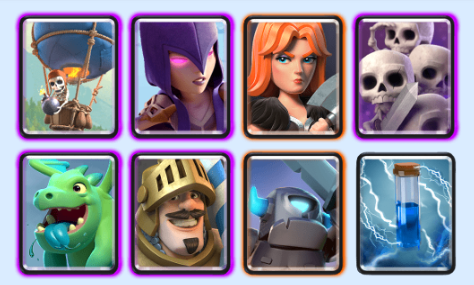 The Giant returns for our recommended deck, and we suggest using him in conjunction with the Goblin Gang and Prince for some serious damage. Here's our preferred deck for the Jungle Arena. The Log is an incredibly powerful card because it's both cheap to use, wipes out weak ground troops, and knocks back any land units that it doesn't kill. Use it against incoming offensive hordes filled with cheap troops and then deploy a Goblin Gang or Night Witch of your own to finish off your opponent's remaining army to begin your counter-push. Hog Mountain is one of the last few Arenas in Clash Royale and this is where you'll start playing against some of the best players in the game. 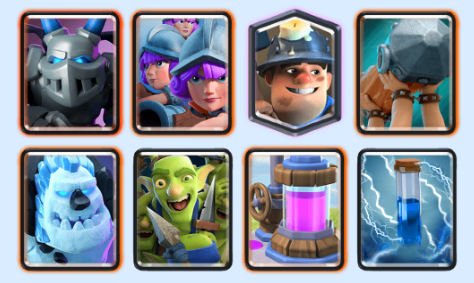 We recommend using the Elixir Collector again in this Arena because it can give you the extra cost you'll need to build powerful offenses spearheaded by the Golem and protected by the Lumberjack and Night Witch. 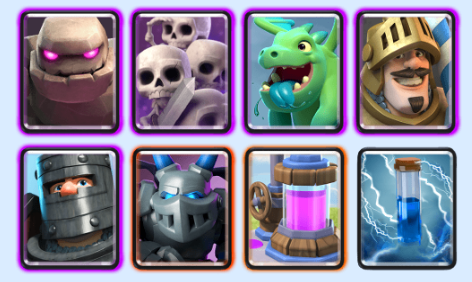 Here's our preferred deck for Arena 10. This deck introduces Poison, which causes damage over time to both troops and buildings. Deploy it against structures like the Tombstone to wipe out incoming Skeletons and destroy the building itself. Then, if your incoming units don't catch the Tombstone in its aggro, use an offensive push from the Golem to take down your opponent's towers. The second-to-last Arena in Clash Royale, the Electro Valley, introduces the final six cards that players can earn in the game. By now your deck should be mostly rounded out and you probably have a few favorite, tested strategies. Don't think you're in the clear, though. Here's what we recommend using for this Arena. Use The Log together with your Giant to wipe out your enemy's defenses and finish a push on a Princess Tower. 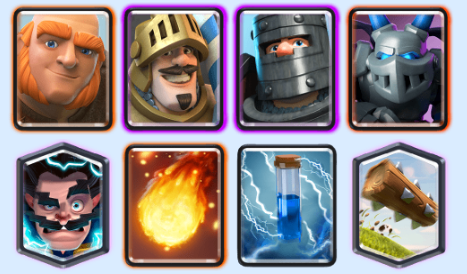 Combined with an Electro Wizard and Mega Minion, you can deal plenty of damage from afar while your opponent's remaining ground and air troops are stuck attacking your Giant. The final Arena before reaching Challenger I, the Legendary Arena, doesn't introduce any new cards. Rather, players will go head-to-head against some of the elites of the Clash Royale matchmaking world. By this point you should have your deck finalized and ready to go against any card in the Arena ladder. Here's one deck you should try using to stay above the rest. 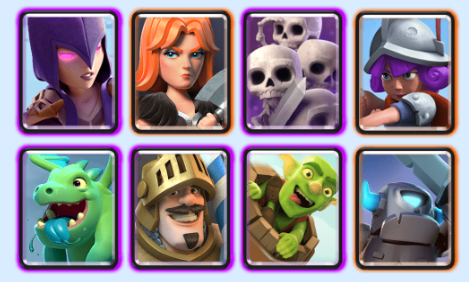 With its Miner, Mega Minions, Goblin Gang, and Three Musketeers, this deck prioritizes ranged attacks and versatility. Use your Ice Golem as either a defensive, tanky unit to counter incoming pushes or with Goblins to damage towers. Deploy your Elixir Collector to keep the pressure going during an offensive push. While these are our recommendations for each Arena in Clash Royale, remember that decks are extremely versatile, and there's no one-size-fits-all solution in the game. Feel free to mix up our deck ideas, add in your own cards, or use a completely different setup altogether. In the end, skill wins matches, not individual cards—although a solid deck certainly helps.